Paintless dent repair (PDR) is the process of removing dents, dings, and hail damage from vehicles. The PDR process is performed using tools to access the back side of panels and slowly massaging the dent out. There are no chemicals involved in the repair itself. The alternative to PDR is traditional body shop methods. These methods consist of stripping the paint, adding fillers, primer, and paint to repair the damage. The body shop industry has made huge strides lately by using more and more eco-friendly products and cutting down on the carbon footprint created using this process, however it still involves chemicals. Every time PDR is used as the first option for door dings and hail damage, the carbon footprint on the environment is lessened. With an average of 500,000 hail damage claims every year, the overall advantages of using the PDR process become extremely significant. Add to this the door dings and dents that occur daily in every city and the benefits are immense. One of the most important jobs of PDR Nation is education. Educating its certified members on safety, ethics, corrosion protection, and the importance of the highest standards of repairs. We are also dedicated to educating the general public on PDR, the benefits of considering PDR before a body shop and why searching for a PDR Nation Certified Technician in their area is advantageous. While the obvious benefits of PDR such as preserving the vehicles original paint, quicker turnaround time, less intrusive methods, and the high quality results are appealing to each vehicle owner, the environmental benefits are important to everyone. PDR Nation is dedicated to preserving the environment. 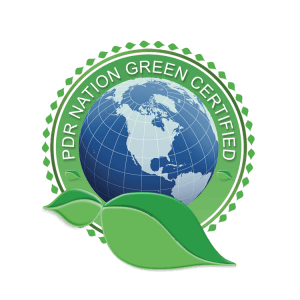 If you are looking for repairs, we encourage you to search out a PDR Nation Green Certified Technician, just look for the PDR Nation logo. Simple, clean. Blue and green.